Project Clearwater, an open-source IMS core initiative for the cloud, launched its website and opened its doors to software developers and systems integrators. 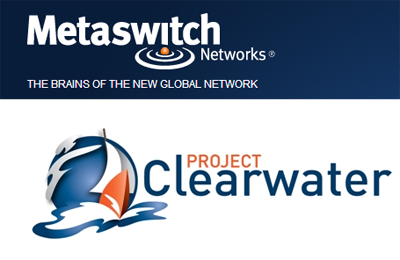 Metaswitch Networks contributed the initial codebase for Project Clearwater and is sponsoring the initiative. Metaswitch said the goal of Project Clearwater is to deliver critical call and session control functions, along with Telephony Application Server (TAS) capabilities, within any virtualized data center. Clearwater is being developed for massive scale and "telco-grade" reliability in private or public Cloud environments, together with exceptionally low running costs of around 2 cents per subscriber per year based on Amazon AWS pricing. Clearwater provides SIP-based call control for voice and video communications and for SIP-based messaging applications. It is designed for deployment on Amazon Web Services or other private cloud infrastructure. “Traditional paths to IMS have been expensive and exceedingly vendor-centric,” says Martin Taylor, CTO of Metaswitch Networks. “Our aim is to provide operators and developers with the keys to quickly move to highly-scaled VoIP and VoLTE networks and create tomorrow’s most advanced Web-scale communications applications. 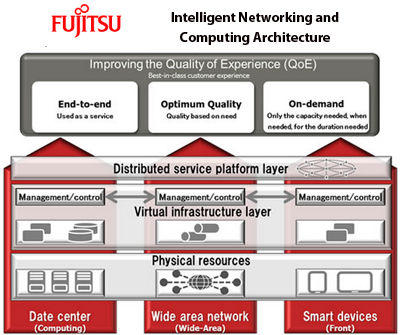 Fujitsu outlined an Intelligent Networking and Computing Architecture based on the principles of software defined networking (SDN) that aims to provide optimized control over three unique ICT domains: data centers, wide area networks, and smart devices. The FUJITSU Intelligent Networking and Computing Architecture can virtualize resources across the three domains. The company said that by administering and controlling these virtualized resources on two layers, a "virtual infrastructure layer" and a "distributed service platform layer," the technology is able to achieve optimal service levels while improving the quality of experience for the end user. The first set of products supporting this vision include an updated version of unified administration and control software for server, storage and network resources, a new switch that supports network virtualization, and a new virtual appliance platform. FUJITSU Software Server Resource Orchestrator -- a resource management software solution that performs unified management of multiple server, storage, and network ICT resources for virtualized consolidation, integration and private cloud applications. The software allocates resources as needed and automatically sets parameters, thereby implementing SDN in data centers. matically configures and modifies virtual network parameters. Using the new switch, network administrators are able to pre-configure networks for each virtual system and modify network settings when adding, replacing or migrating servers, thereby sidestepping the troublesome task of network operations. PRIMERGY Converged Fabric Switch -- this virtual appliance platform virtualizes the IPCOM network server, which integrates functions such as firewalls and load balancers, and can run multiple instances of virtual IPCOM on a single piece of hardware. Unlike in the past, where a separate IPCOM would have to be provisioned for each virtual system, the new IPCOM VX Series allows a single piece of hardware to handle multiple virtual systems, obviating the need for additional IPCOM hardware when adding virtual systems. This, in turn, delivers greater speed and flexibility. Telefónica reported Q1 2013 revenue of 14,141 million euros, a decrease of 1.6% compared to a year earlier not counting impacts from exchange rate fluctuations, and down 8.8% in actual terms. The company's OIBDA reached 4,567 million euros and the operating result was 2,066 million euros, down 0.1% and 2.9%, respectively compared to Q1 2012. Telefónica Europe is impacted by the macroeconomic situation, the intense level of competition and the negative impact of regulation, while Telefónica Latin America continues to grow. At the end of March the Telefónica Group had a customer base of almost 316 million accesses (+2%), over 78% of whom are mobile customers. There was acceleration in the growth of the contract mobile accesses to +8% in the quarter, with year-on-year increases reaching +13% in Latin America. Latin America generated over 50% of the consolidated revenue. 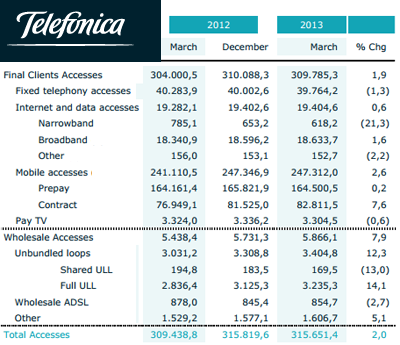 Brazil has become Telefónica's biggest market in revenue generation, surpassing Spain for the first time. Mobile accesses stood at 247.3 million at the end of the quarter (+3% year-on-year). Mobile broadband accesses -accesses with a data tariff attached- posted a solid 34% year-on-year growth to surpass 55 million at the end of March 2013 and accounted for 22% of mobile accesses (+5 percentage points year-on-year). Smartphones accounted for 20% of the total mobile access base (+6% pp year on year). Non-SMS mobile data revenues increased 21.9% in organic terms and already represent 62% of total mobile data revenues (56% in the first quarter of 2012). Telefónica Brasil served 91.1 million at the end of March, up 1% year-on-year despite the application of more restrictive accounting criteria for prepay customers. Mobile accesses stood at 76.0 million (+2% year-on-year), with contract segment growing by 17% year-on-year and accounting for 26% of mobile accesses. In the first quarter of 2013, Telefónica's net financial debt was negatively impacted by exceptional effects, specifically the devaluation of the Venezuelan bolivar (€873M) and the payments for spectrum auctions (€701M) as well as the recurrent first quarter´s seasonal effect. Telefónica invested 1,941 million euros in the first quarter of the year, including the acquisition of spectrum in the United Kingdom and Uruguay. 82% of the total investment was in growth areas, specifically 3G, 4G and fibre networks. Telefónica has 132,726 employees worldwide, which is about the same as last year. 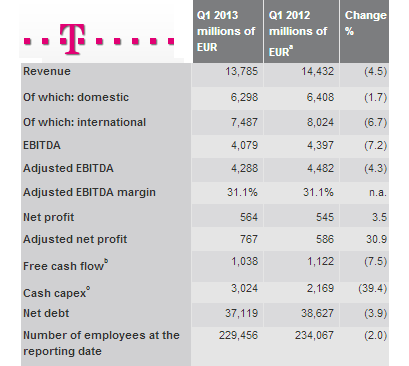 Deutsche Telekom's net revenue for Q1 2013 decreased by 4.5 percent compared with the prior-year period to EUR 13.8 billion and adjusted EBITDA declined by 4.3 percent to EUR 4.3 billion. However, Deutsche Telekom generated a year-on-year increase in adjusted net profit of more than 30 percent to EUR 767 million in the first quarter. Reported net profit increased by 3.5 percent to EUR 564 million. "We have resolved some major issues," said René Obermann, Chairman of the Board of Management of Deutsche Telekom. "The biggest of those were our customer figures in the United States, which are finally back on the up. The positive regulatory decisions form the basis for our planned broadband build-out." Smartphone sales recorded growth of 16 percent, reaching over a million. In the fixed network, the total number of VDSL and FTTH lined climbed 63 percent, compared with the first quarter of 2012, to 1.1 million. With 156,000 new fiber-optic customers in the quarter, Deutsche Telekom achieved a record high. Of these customers, 46,000 came from the wholesale area, mainly due to the successful launch of what is known as the contingent model. The number of mobile contract customers increased by 441,000 in the first three months of the year, after a decline of 107,000 in the prior-year quarter. In addition to the expanding reseller segment (service providers), new customer growth was also attributable to 144,000 new customers under the Deutsche Telekom and Congstar brands. Revenue in the Germany operating segment amounted to EUR 5.6 billion in the first quarter of 2013, 1.6 percent lower than in the prior-year period. T-Mobile USA completed its merger with MetroPCS as of April 30, 2013. T-Mobile USA sold some 500,000 iPhones in the first four weeks after marketing began. The number of branded contract customers declined by 199,000, after a decrease of 510,000 a year earlier. The total number of customers increased by 579,000 to 34 million. Revenue in the United States operating segment amounted to EUR 3.5 billion in the first quarter, 8.0 percent lower than in the prior-year period. The European subsidiaries made progress in growth areas, while at the same time battling with negative effects from the economy and regulation. Total revenue in the Europe operating segment declined 6.9 percent year-on-year to EUR 3.3 billion. Excluding the reduction in mobile termination rates, the decline in revenue would have been much lower at 3.4 percent. In Greece, for example, rates were reduced by 74 percent compared with the prior-year quarter. Mobile data revenue in Europe increased substantially by 14 percent year-on-year due to exchange rate effects. Deutsche Telekom's Systems Solutions segment recorded strong order entry of EUR 2.1 billion, up 33 percent compared with the prior-year period. This was due to agreements with EADS and the Swiss National Railways (SBB) as well as numerous deals for cloud services. Inphi is demoing interoperability of its second generation Tri-Rate PHY/SerDes Gearbox (GB) ICs with Luxtera and TE Connectivity (TE) optical modules at this week's Interop in Las Vegas. Inphi is showcasing its new Tri-Rate IN112510-LD 100G GB interoperating with a Silicon Photonics QSFP28 module from Luxtera, as well as VCSEL based QSFP28 from TE to highlight the availability of the QSFP28 form factor using different optics technologies. The new GB ICs with Inphi's Tri-Rate foundation enables seamless support of 10G, 40G and 100G Ethernet and OTN on a single line card. "Our next-generation Tri-Rate PHY/SerDes GB ICs interoperating with industry leading QSFP28 technology from Luxtera and TE demonstrates that the technology of the future is now available for designers to successfully build ultra-high density line cards for hyper scale data center systems," said Siddharth Sheth, vice president of marketing for Inphi's high-speed connectivity products. "As an agnostic vendor to the type of technology used in QSFP28 modules, Inphi continues to work with a broad ecosystem of partners using Silicon Photonics, VCSEL or other optics and laser sources to further the deployment of 100G." Luxtera is also showing its 100G Silicon Photonics chipset packaged in a QSFP28. Net Optics introduced its xStream 40 Network Packet Broker (NPB) for 40G networks, providing advanced filtering, aggregation, load-balancing, time stamping, etc. 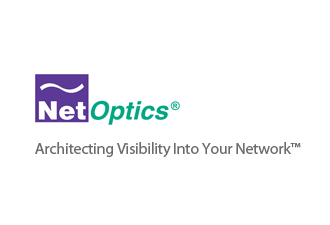 Net Optics said its new platform provides 30 percent improved latency over the previous latency record. xStream 40 also provides twenty percent more filters and 2.6X higher port density with the same form factor. SPYKE 1.5 delivers AA-NPM supporting 10G networks and is designed to monitor applications and networks of companies from small branch sites to 10G Enterprise-wide networks. New support for 10G traffic monitoring allows Enterprise customers to deploy a plug-and-play, cost effective solution to complement current monitoring infrastructure. AA-NPM demands deep diving into packet payloads to identify the underlying application and extract relevant performance indicators. Spyke 1.5's DPI engine adds coverage for hundreds of applications, letting customers examine and extract application meta-data for fast troubleshooting and problem resolution. Availability for xStream 40 and Spyke 1.5 are expected early Q3. "Most monitoring tools see packet headers and provide flow information only," says Dave Britt, Net Optics Director of APM Technologies, "whereas DPI is like opening a letter to see the content." 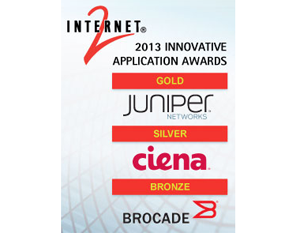 Internet2, in conjunction with Juniper Networks, Ciena, and Brocade, is offering cash awards for winning open source, data movement, software-defined networking (SDN) enabled, end user applications, which benefit the research and education (R&E) community, implemented on the nation’s first open, national-scale SDN platform -- the Internet2 Network. The new Internet2 Network is the first open, national-scale 100G network that employs SDN and OpenFlow standards. It includes equipment from Juniper Networks, Ciena, and Brocade. “The new Internet2 Network can advance global research collaboration in previously unimaginable ways," said Rob Vietzke, vice president of Network Services, Internet2. “Leveraging our new 100G, SDN-enabled network, we're on the hunt for the most innovative applications that help to accelerate and transform discovery in big data sciences." Vodafone Hutchison Australia has selected the Cisco ASR 5500 as the mobile multimedia core platform for its LTE network. The Cisco ASR 5500 will be the foundation of VHA's Evolved Packet Core (EPC). In addition, VHA is implementing the Cisco 7613 mobile security gateway as part of its Enhanced Packet Core solution. Cisco will provide professional services on the project. Financial terms were not disclosed. 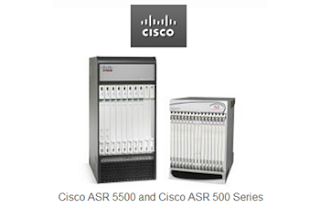 Cisco noted that over 210 other service providers have selected the Cisco ASR 5000 Series platform. David Flynn resigned as CEO and President of Fusion-io, effective immediately. The company confirmed that co-founder, Rick White, also resigned as Chief Marketing Officer. Both will pursue entrepreneurial investing activities. Fusion-io named Shane Robison as its new Chairman, CEO and President. Mr. Robison, 59, has more than 30 years of experience in senior business management and product development roles with AT&T Labs, Cadence Design Systems and Apple. He most recently served as Executive Vice President and Chief Strategy and Technology Officer of Hewlett-Packard Company from May 2002 until November 1, 2011. Narus, which specializes in big data analytics for cybersecurity solutions, named Joe Eskew as head of global sales. Eskew comes to Narus from Oracle, where he served as vice president of worldwide sales for the virtual desktop infrastructure global business unit. Previously, he held executive-level sales positions with Citrix Systems, Inxight Software and Network Associates. Arista Networks was named as the Grand Prize Winner of the 2013 Best of Interop Awards. Earlier this month, Arista Networks announced significant enhancements enabling its flagship Arista 7500 modular switching platform to scale to support over 100,000 servers and millions of virtual machines. 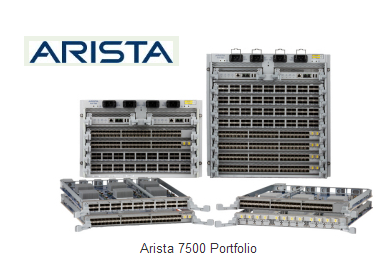 The Arista 7500E offers 1,152 10GbE, 288 40GbE, or 96 100GbE wire-speed ports.